I made it a point to watch the great Cate Blanchett and Hugo Weaving for "Hedda Gabler" at the Brooklyn Academy of Music a couple of years ago. 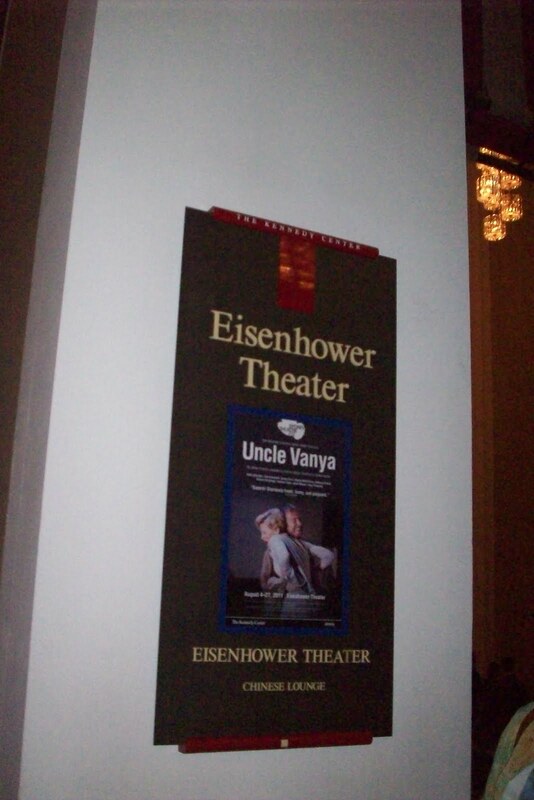 A few weeks ago, Pinky was planning her trip to the Washington D. C. area and said the duo is back together for the Sydney Theatre Company's production of Uncle Vanya at the Kennedy Center. Although I was intimidated by Anton Chekhov's play---based solely on his reputation for doom and gloom---I couldn't pass up the chance to see them again. 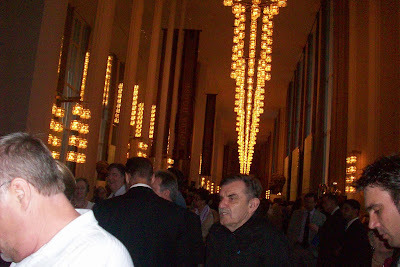 Plus it would be a chance to watch at the Kennedy Center for the first time. We were fortunate to have purchased tickets for opening night, 06 August. Although it made a stage door experience unlikely, it was also another first for us. We have never watched an opening night performance! This show was directed by acclaimed Hungarian stage director, Tamás Ascher. The dense material was made less threatening by Ms. Blanchett's husband, Andrew Upton. He brilliantly adapted the play with humor and even dance sequences. Set in Russia, but changed to the mid-20th century instead of the 1890s, the Serebrakov farm is shaken up by the arrival of favorite son Professor Aleksandr and his younger, beautiful and bored wife Yelena. Country life starts to change for the farm's original inhabitants. Despite the characters' burgeoning passions, their lives oddly take on a complacency and isolation that make their fates more desperate and tragic. The pacing, the set/lighting/sound/costume design are all very effective in highlighting the languor pervading the estate, as well as the contrast between country folk and the urbane Yelena and her tyrannical spouse. 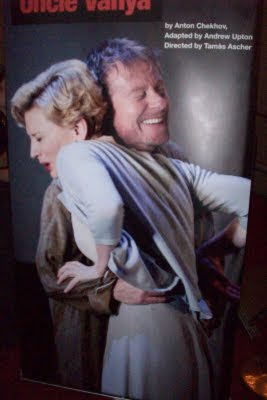 A true ensemble piece, this amazing cast is led by the extraordinary Richard Roxburgh as the dissatisfied Uncle Vanya; John Bell as his brother, the retired and rheumatic Professor; Cate Blanchett as Yelena (sidenote: who knew she's so good at physical comedy? That woman can do anything. She's Australia's national treasure! ); the poignant Hayley McElhinney as her hardworking and plain stepdaughter Sonya; and the marvelous Hugo Weaving as the doctor Astrov, who Sonya secretly loves. 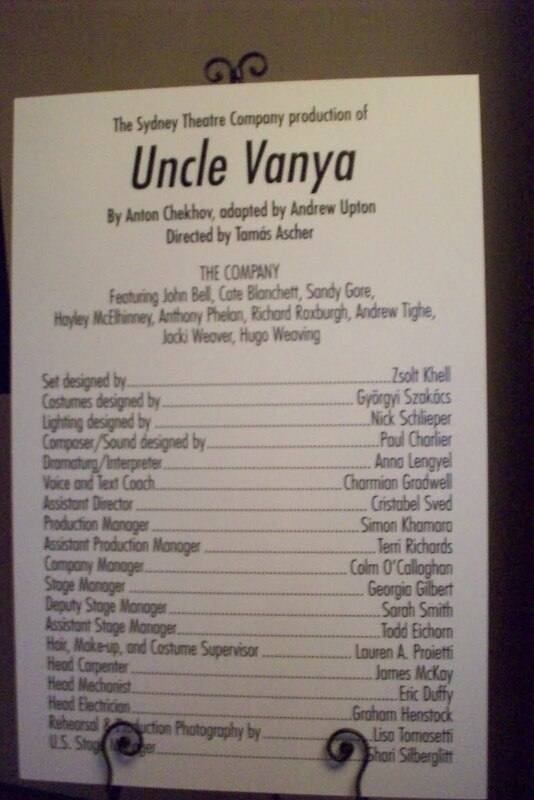 The cast is rounded out by Jacki Weaver as sympathetic nanny Marina, Anthony Phelan as Telegin, Andrew Tighe as a laborer, and Sandy Gore as the matriarch Maria. The story is a study on human nature, and the dysfunction in every family: love, regret, admiration, anger, envy. Vanya embodies ennui and discontent. Despite its light moments, I left the theatre with a sense of unease (despite being bowled over yet again by Cate's stupendous acting abilities and stage presence). Chekhov makes you reflect on inaction, missed opportunities, resignation about one's lot in life. The show will run until 27 August 2011. Get tickets here. Oh and have I mentioned Cate's stunning, bravura performance? I will leave it up to Pinky to rave more about her.